The medical chart is the permanent record of patient treatment and outcomes. It is the way to communicate information among health care team members. The records should document all of the care given to a patient, but often these records are incomplete, illogical, and in the case of handwritten notes, illegible. Most lawsuits are initiated long after your memory of that patient has faded. You only will have the record to rely on, so make sure it is complete and accurate. Your attitude makes a difference. If you are suffering from burnout or lack of career satisfaction, take an honest look at yourself. Perhaps 2017 is the time to make a career change or find a new job in a different care setting. Do you have these traits? Recognize when you must step back, as well as when you must push forward. If you are treating wounds, you must have specific wound care training. Period. There is no room for leeway here. Unfortunately, many people are treating wounds without the proper knowledge base. You must have training that is on par with your duties. If you are not trained, don’t do it. Speak to your superiors and explain that you are not comfortable with the legal risk associated with performing duties that you are not fully trained to do. The responsibility for training falls on both the practitioner and the health care facility or company. Numerous convenient training opportunities are available both online and in person if you need to update your skills, so you really have no excuse for not educating yourself. If you need training, the Wound Care Education Institute (WCEI) is a great place to start. The term standard of care often is bandied about without a clear definition of its meaning. This term is interpreted in many different ways. Often the legal standard of care is defined as the care a minimally competent physician or practitioner in the same field would do in the same situation, with the same resources. Some people equate clinical practice guidelines (CPGs) with the standard of care, but that is not always the case. In wound care, multiple organizations have issued CPGs. It is important to know which guideline your facility follows and what that guideline says because differences exist between guidelines. Often the policy and procedure manual is based on whichever CPG you are using as supporting evidence. This means your policy and procedure manual must stay current and up to date, yet this often is not the case. If you conquer RATS, you will have a successful 2017. Please don’t hesitate to contact me with any questions or ideas. 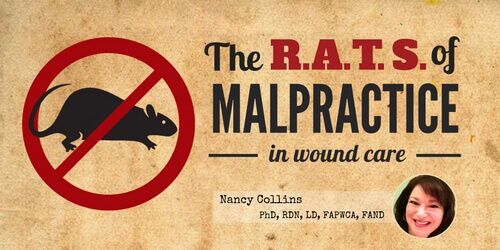 Nancy Collins, PhD, RDN, LD, FAPWCA, FAND, is a registered dietitian with expertise in wound care, malnutrition, and medico-legal issues. Dr. Collins strives to improve patient outcomes and patient satisfaction through better communication. To contact her, visit her website, www.drnancycollins.com. This entry was posted on Friday, December 16th, 2016 at 8:22 pm	and is filed under Education, Legal, Litigation Wound Care, Wound Care. You can follow any responses to this entry through the RSS 2.0 feed. Both comments and pings are currently closed.